We love books around here and I am happy that my boys have tons and tons of books. They tend to gravitate towards books about animals and lately our six year old has been bringing science related books home from the school library. Specifically books about planets, spaceships and other space fun. Future astronaut or rocket scientist? Who knows. But I will certainly nurture his interest for science! This past Christmas my grandparents gave him a subscription to the National Geographic Kids Magazine and it is something we have enjoyed looking through together. When I saw that the National Geographic Kids Almanac 2012 was available, which has a similar style as the magazine, I knew I just had to get this for him! 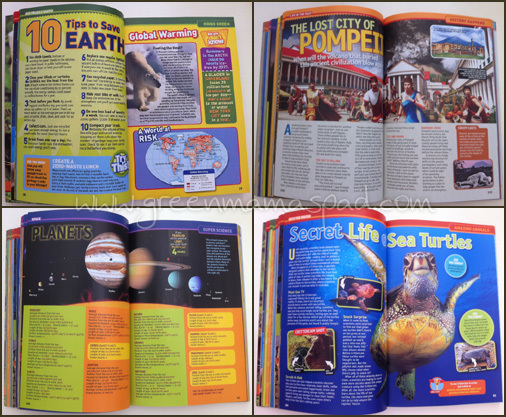 "Overflowing with extras and in full color, the National Geographic Kids Almanac 2012 features timely (as well as timeless) information on popular subjects such as amazing animals, cool inventions, world cultures, science, sports, technology, history and more. Supersized new sections deliver hours of fun with games, weird-but-true trivia and facts on newly discovered dinosaurs. More than 500 incredible photographs, 20 full-color maps and 350 easy-to-read pages jam-packed with fun lure kids into learning. Homework Help sections and project ideas make this a book kids will return to again and again throughout the year." Recommended for ages 8 and up, this book is jam-packed with amazing photos, fun facts and really just a lot of great information. Every night before bed either myself or my husband read a book to each of our boys. My six year old and I have been enjoying flipping through the pages of this almanac. We usually tackle a few pages a night and we are making our way through the entire thing. It is also nice to have something different to read for a change because even though they have a million books, they always ask us to read the same ones over and over. The National Geographic Kids Almanac has a variety of chapters inside. One of the very first ones you will find is the "Going Green" chapter which of course thrilled me. This is a great tool to use to start talking to your child about taking care of the Earth and environment. Within the green pages you will find cool green inventions, ways to protect and conserve our water sources, tips to save the Earth, alternative energy, the consequences of deep water drilling, pollution and more. Some of the other chapters in the almanac are Amazing Animals, Culture Connection, Super Science, History Happens and Geography Rocks. New in the almanac for 2012 is the interactive smartphone feature. At the beginning of each chapter you will find a QR (quick response) code like the one shown above. 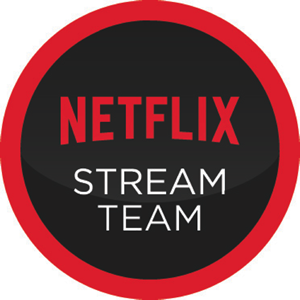 You will need to download a free QR code reader and then you can scan in each code for special bonus features like video, games and slide shows. For example when you scan the code at the beginning of the Going Green chapter, you are brought to a little quiz to test your green knowledge. If you don't have a smartphone that is OK, they give you a website where you can access all of those same extra features. I don't let my children touch my iPhone, as much as they really want to, but we will look at these together on it while I do the navigating. We really have been enjoying our almanac and learning some cool things that we didn't know before. Both my husband and i feel that science is so important for our children to learn about and this book is a really fun tool to help encourage that. I definitely think this is a must have to put on any child's book shelf. 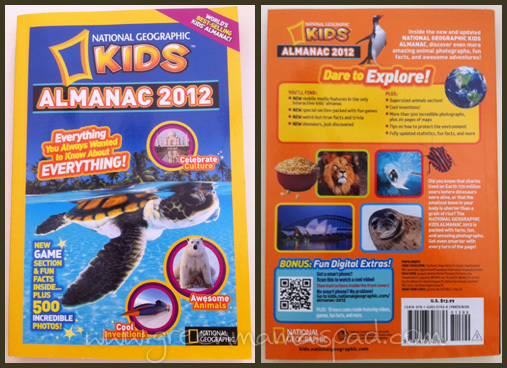 The National Geographic Kids Almanac 2012 is available for purchase at Barnes & Noble, the National Geographic Store and wherever books are sold. If you head over to Barnes & Noble you can flip through a few pages right online. Tell me who you are trying to win this book for and why you think they would like it! - "Like" National Geographic Kids on Facebook and tell them I sent you! Please leave me your first name and last name initial to validate. - "Like" Green Mama's Pad on Facebook. Please leave me your first name and last name initial to validate. Be sure to leave me a note on my wall! - Follow Green Mama's Pad on StumbleUpon. Worth 2 entries so leave 2 comments plus your StumbleUpon ID. This giveaway is open to legal US residents 18+ only and will end on Thursday, June 30 at 11:59pm EST. Two winners will be chosen at random using Random.org and will be posted on the Winner's Announcement Page. Winner has 48 hours to claim his/her prize otherwise a new winner will be picked. Please leave your e-mail address in all of your comment(s) so I can contact you. I will not share your e-mail address with anyone, it will strictly be used to notify you if you win. Good luck! Please note that the opinions and views expressed in this review are my own and based on my personal experience with the product and/or company. You may encounter a different experience with this than I did. I received a product free of charge for review. This post contains affiliate links. I would love to win this Almanac for my 8 year old daughter. She has last year's Almanac and loves to read about all kinds of nature and is a fact checker for sure. She would absolutely love this! Thanks so much for hosting this giveaway! Like National Geographic Kids on Facebook (Eloise Bowen Carlson) and I wrote on their wall that you sent me! Like you on Facebook (Eloise Bowen Carlson) and I wrote on your wall. I'd like to win this for my tween daughter. I think she's learn so much from it and find lots of interesting facts. Thanks. My nephew! He loves to know more than adults. These are his favorite kind of books. I am trying to win this for my son...I think he would love reading it! My son would love reading this! "Like" Green Mama's Pad on Facebook Lisa W.
I am trying to win this for my 9 year old son and I know he will like it because he has the 2010 book and because we seen this version at the bookstore and he wanted me to buy it. He loves this type of information. I would love this for both my kids, they love learning about things. I like Green Mama's Pad on Facebook and commented on your page: Wendi B. My daughter really wants this for herself and I'd like to get it for her. It would give her something to read on our road trip vacation in August. I already Like" National Geographic Kids on Facebook. I "Like" Green Mama's Pad on Facebook. Sue D.
I follow @GreenMamasPad and @NGKidsBks on Twitter and and tweeted this giveaway. I am trying to win for my 8 year old because she loves these type of reference books, world record books, and wacky facts. I am trying to win this for my grandson. He would like it because he was curious about everything! I would like to win this for my son because he loves to learn facts about all sorts of things. My 11-yr old daughter & my 9-yr old son would both LOVE this! They're both very much into science, animals & earth! This would keep them occupied & interested for hours & hours & hours! I would love to win this for my 9 year old twins. They would love it. I would like this for our family book shelf! My son has 5 yrs worth of these and would love 2012! For my son who loves science! My daughter would love it.. she loves to read.